There are over 50,000 taxis in Germany and using them is much the same as in most other locales. German taxis are cream-colored with a black and yellow taxi sign on the roof. In the birthplace of the luxury sedan, it should be no surprise that the bulk of the taxi fleet is comprised of sleek and plush Mercedes and Audis. For larger parties or payloads, you'll find equally comfortable minivans and station wagons. As with many aspects of German life, the taxi industry is heavily regulated, so foreigners need not worry about "being taken for a ride". The best way to hire a taxi is to find one at a taxi stand. You will find these at major activity centers such as train stations, airports, large hotels, shopping areas, etc. Usually you will find several taxis waiting at these locations. Generally, you should hire the first taxi in the line, but you can pick any of them waiting at the stand, especially if you need a larger vehicle than the first one. If there are no taxis waiting, see if there is a "taxi phone" (Taxirufsäule) nearby. These call boxes will connect you to the central taxi dispatch office, which will then send a cab to your location. These taxi phones also often have an emergency call function as well-- make sure you push the correct button if applicable. You can also order a taxi by phone. Every city has a taxi hotline-- look in the phone book under "Taxi-Zentrale". In larger hotels, the concierge or front desk staff can also arrange a taxi for you. Many cities now also offer online ordering of taxis. Theoretically, you can hail a cab on the street, but most of the time one of the previously mentioned options will be more reliable. By law, taxi drivers cannot refuse to accept a customer for travel within the municipality or official local taxi tariff zone unless the customer is excessively intoxicated, dirty, or sick, carrying a weapon, traveling with an aggressive dog, or is obviously unable to pay. If you don't speak German, the best way to tell the driver where to take you is to write the address on a slip of paper and hand it to the driver when you get in. You can read the fare on the meter when it's time to pay. All taxis in Germany are required to have a visible meter and fares are regulated by local laws within a designated local tariff zone (Pflichtfahrgebietes). 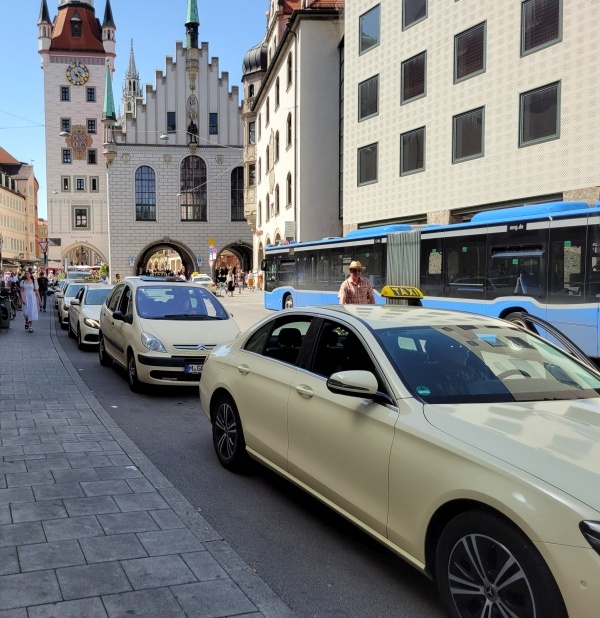 Rates vary by city, but generally there is a €2-3 "drop charge" or basic fee (Grundpreis), then a rate of €1-3 per kilometer with slightly lower rates for longer distances (typically in excess of 2 to 5 kilometers). Time spent waiting (which includes waiting in traffic) is also charged at a typical rate of anywhere from €0.10-0.50 per minute, with some cities allowing for a minute or two of idling free of charge and some with higher fees for longer waiting time. Some cities have lower fares (or even free) if you're making a round-trip. Fares may also vary by time of day and/or day of the week. For trips over 50 km, you must negotiate the fare in advance. International trips are permissible. The tax rate of 7% for trips of less than 50 km and 19% for longer trips is included in the fare, but must also be itemized separately on the meter and receipt. Unless you specify the route, the driver is required to chose the shortest route. In addition to the fare, taxi drivers are also permitted to charge an additional service fee for special services including nighttime (typically defined as 10pm to 6am) and Sunday or holiday service; transporting of baggage, animals, or of wheelchair-bound persons; courier service; and use of credit cards. Minivan and station wagon taxis also typically add a surcharge. Taxi drivers are generally very friendly, helpful, honest, and knowledgeable about their city. If you ever experience bad service, note the vehicle's number located near the meter and/or in the rear window and report the experience to the Taxi-Zentrale. To tip the driver, round the fare up to the nearest Euro. For longer trips or if you receive extra or exceptional service, it's customary to tip 5% to 10% of the fare. If you found the information on this site helpful, please consider helping support it by making a small donation! Thanks! The information provided on this website is provided on an "as-is" basis without warranties of any kind either express or implied. The author and his agents make no warranties or representations of any kind concerning any information contained in this website. This website is provided only as general information. The author expressly disclaims all liability with respect to actions taken or not taken based upon the information contained herein or with respect to any errors or omissions in such information. All opinions expressed are strictly those of the author. This site is not affiliated in any way with any official agency.